New Delhi: An Indian doctor who was recently honoured by UAE’s visiting foreign minister here for her five decades of contribution to health care in his country, today said her hospital group aims to strengthen the Indo-UAE relations with skill development of professionals and medical tourism initiatives. 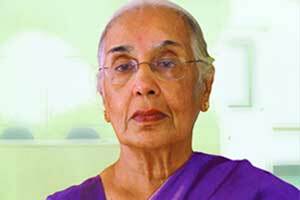 Zulekha Daud, 80, is the “first Indian woman doctor,” who had moved to the United Arab Emirates in the 60s and started her practice from scratch in Sharjah, an official of the hospital group said. She was felicitated by UAE Foreign Minister Sheikh Abdullah Bin Zayed Al Nahyan at a private function in Delhi on Monday, the official said. After years of dedicated service, Zulekha Hospital was established in Sharjah in 1992 through her efforts. It started off as a 30-bed hospital with basic facilities for gynecology, obstetrics, surgery, medicine and pediatrics. The Zulekha Healthcare Group includes two multidisciplinary hospitals in Dubai and Sharjah, as well as three UAE medical centres and three pharmacies providing specialized treatments in over 30 disciplines, the Sharjah-based group said in a statement, adding it has also opened a multidisciplinary hospital in India. “We hope to achieve more synchronisation and strengthen Indo-UAE relations with skill development of medical professionals and medical tourism initiatives,” Daud was quoted as saying in the statement. The recognition accorded to her coincides with the ‘Year of Zayed’ Initiative during which UAE is commemorating the indelible legacy of its founding father. Abdullah presented her with a letter of thanks and appreciation for her “five decades of valuable contributions to healthcare sector in the UAE” and her tireless efforts to boost welfare of UAE citizens and residents, the group said. Daud said the recognition is an absolute honour and will “inspire me to do more for the nation”. The UAE foreign minister is paying a visit to India from June 24-30.